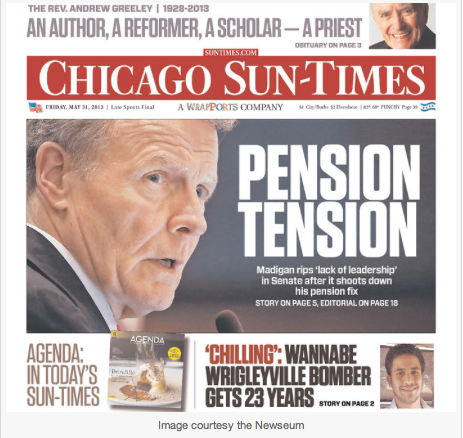 Yesterday, the Chicago Sun-Times announced that they were firing their entire photography staff. Today, they announced that they would start training their reporters to take their own photos using an iPhone. Media writer Robert Feder surfaced this on Facebook and a lot of discussion ensued. I am sure I will catch a lot of flack over this (could it be worse than the librarians? ), but this is both tragic and inevitable. Tragic because the professional photographers are both talented and dedicated. Inevitable because this is where the technology is taking us. Many years ago (forgive me if I repeat myself here), my very good friend PF Bentley was the White House photographer for Time Magazine. This is the top of the craft and he deserved it. Books. Magazines. And great stuff. Once, a few years ago (more than a few now), he invited me to come along on a shoot. He had just gotten one of the very first Canon digital cameras. Many shots at no cost. To demonstrate this great new technology, PF held the camera high over his head, pointed it in the general direction of the event and held down the shutter button. Buried in there was a good one, for sure. But buried in that new technology was the end of his career. Not too much later, Time Magazine fired all their contract photographers. This is the inevitable consequence of new technologies. Sure, the work of a reporter pointing an iPhone at a subject is not going to give you a photograph as good as Dirck Halstead would have done. The standards may have dropped, but probably (apparently) most readers just either won't notice or won't care. "First they came for the people who did the classifieds, and I did not speak out because I didn't work in classifieds. Then they came for the photographers...."
A lot more or the 'traditional' architecture of newspapers and TV news is going to change before this is all over, and this is no bad thing. This is how old industries reinvent themselves to survive and thrive in a very different world from that in which they were first created.